"Thank you both so much for all the amazing, incredible & beautiful hard work you did to make our wedding awesome. The flowers, the decorations -you made the wedding a home for the night. So amazing!" "There are no words to adequately express my gratitude for the breathtaking work you did on our wedding florals. 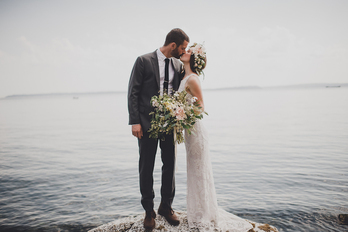 You perfectly captured the aesthetic of our celebration and went so above and beyond my wildest dreams - I could not have imagined any more gorgeously arranged bouquets and boutonnieres if I was picking them out of the pages of Martha Stewart Wedding." "Melissa did the flowers for our wedding...and the phrase 'did the flowers' or 'florist' is not even close to what Melissa was for our big event. She turned our venue space into beauty and magic. I was so, SO thrilled with how everything turned out...she really was the difference in making our wedding feel personal to us. Melissa met with us once to talk about our vision (which, sadly, we didn't have much of! ), we gave her a copy of our invitation, a basic budget, and hoped for the best. She came back with an awesome personalized menu for us to pick and choose from, as well as a pinterest board for some visual help. I absolutely recommend Melissa and Flying Bear Farm for any event you have...she is awesome!!" She has always been able to capture the personalities of the bride and groom in her floral displays. She really works some incredible magic! "My first experience with FBF was in 2009. She transformed the Skansonia Ferry Boat (on the 4th of July, no less) into a magical, colorful, festive space with her well thought out designs and creative placement of bright floral bouquets. All my guests oohed and ahhed over the flowers, which they got to take home. She even made me the most beautiful bridal bouquet I have seen to date! Since my wedding, she has done several others that I have been witness to. Each and every time, her designs take my breath away. Her design aesthetic is whimsical, magical, fantasy, but unique to her. She has always been able to capture the personalities of the bride and groom in her floral displays. She really works some incredible magic! All in all, FBF is an amazing artist and farmgirl. She has talents even beyond the ones mentioned above. She is loving and lovely, gives healing hugs that warm the soul and has a smile that can be seen from outer space! You would be lucky to meet her, let alone enjoy her incredible talents!" Thank you so much for celebrating our wedding with us and for the incredible floral magic! You helped turn the barn into the whimsical faerie wonderland it became for the evening and blew us (and everyone) away with your creativity and attention to detail. Thank you for all your hard work and for your lovely friendship! Love Alexa + Matt"
"I just wanted to drop you a quick line to express my sincere gratitude for all that you did to make our wedding extra beautiful. Your work was truly breathtaking, and I don't think I could be more pleased with the product. You have been a joy to work with throughout the process, and you made my vision (perhaps, even a better one) come to reality. I loved the boutonnieres, the bouquets, and the aisle, but I was utterly stunned by how you transformed the tables. It was gorgeous beyond belief! Again, hats off to you. You are amazing!" 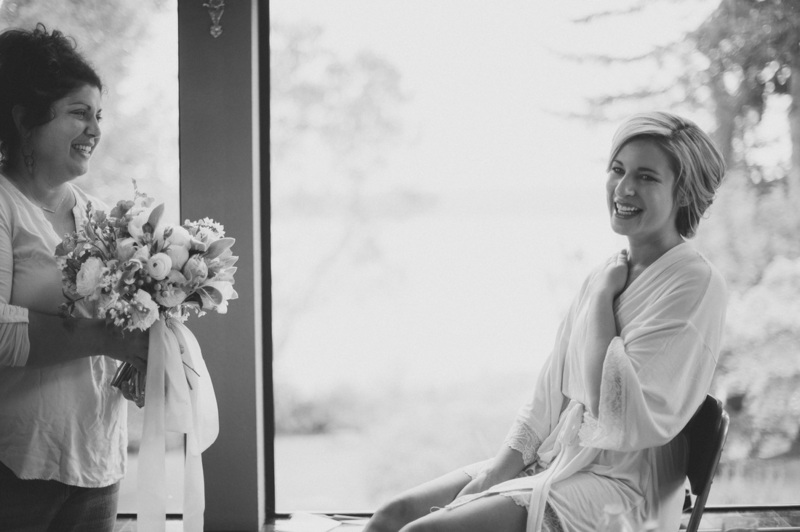 "Working with Melissa was the best experience I could have hoped for in planning our wedding. From our first meeting, to the countless emails and sharing of Pinterest boards, Melissa helped us to perfectly articulate our vision for our fall wedding. I would like to stress that she didn't simply design beautiful bouquets and centerpieces, she created an experience and an atmosphere that not only blew us away, but also equally impressed our guests. Melissa's professionalism, passion, and ability to think on the spot (a deluge of rain changed our plans last minute) far exceeded our expectations. We can't thank you enough Flying Bear Farm!" "I just wanted to say thank you so much for everything you did for Sam and I during our big day! The place looked beautiful with your flower creations draped with ferns and other glorious greens. My bouquet was ridiculously gorgeous as was my bridemaids' bouquets...as were the boutonnières. PERFECT! My head table looked spectacular and exactly what I envisioned. The arbor you created for the ceremony was GORGEOUS. I loved it so much. Even to the little detail of flowers everywhere really created the feel I wanted for my wedding. So thank you!! You and your husband are fantastic and true nature artists. I can't wait to recommend you to other people! "Melissa did an amazing job on my flowers for my wedding! The bouquets were beyond stunning!! She had her work cut out for her with 10 boutonnieres, 6 bridesmaid bouquets and an elaborate bridal bouquet. I loved that she was able to take my vision and make it into something beautiful and also was able to be creative. Melissa was so easy to work with and I am so happy I went with her and that her flowers are local!! "When looking up Whidbey Island florists, Melissa's work immediately caught my eye. I had confidence she would be the right one to do the bouquets and boutonnières for my wedding. The flowers were perfect. Seasonal bouquets filled with dahlias, garden roses, stock, and greenery made the most gorgeous arrangements I'd ever seen. My bridesmaids and I were in love with my giant dahlias. Melissa was so easy to work with and responded quickly to emails. I would recommend her to anyone in a heartbeat." "Long story short my sister and I wanted to send my grandparents, who live on the Island, a bouquet. I looked at the different florist options, and after stalking Flying Bear's instagram, I was sold. Everything looked BEAUTIFUL. Working with Melissa was great - she was super understanding when we needed to push back the delivery and seemed truly concerned about my grandparents/family. She prepared a BEAUTIFUL overflowing arrangement - I was blown away and so was the rest of my family. My grandma said it was the prettiest bouquet she has ever seen. I cannot recommend Flying Bear Farm enough."